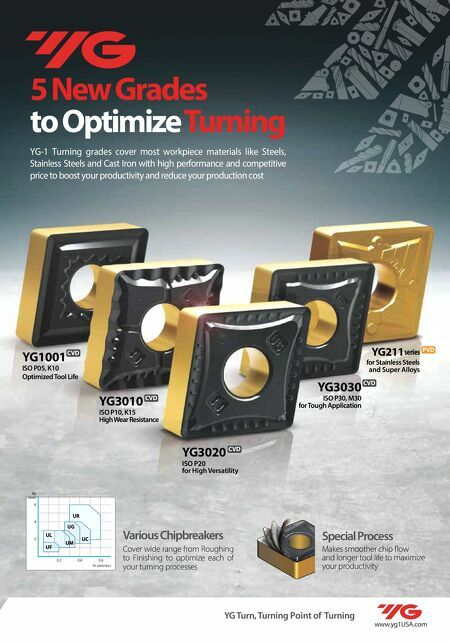 MMS NOVEMBER 2018 36 mmsonline.com QUALITY GAGING TIPS Measurement Tools Solutions for automated deburring High-performance carbide burs engineered for optimal removal on specific materials M-BRAD ® abrasive brushes for aggressive, vibration-free deburring Custom, made-to-order solutions designed to meet your unique application Contact us today for more information. 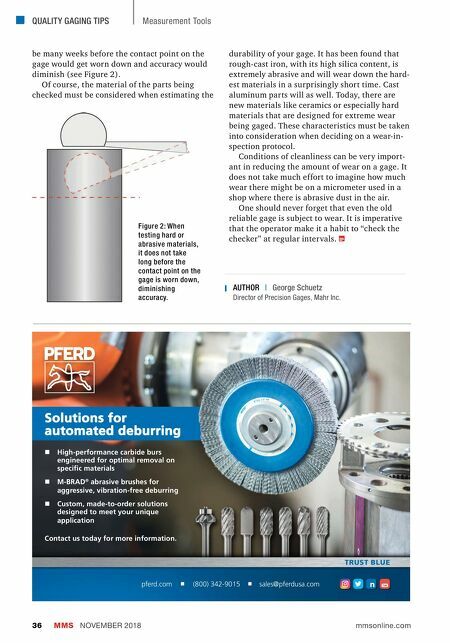 pferd.com (800) 342-9015 sales@pferdusa.com TRUST BLUE AUTHOR | George Schuetz Director of Precision Gages, Mahr Inc. be many weeks before the contact point on the gage would get worn down and accuracy would diminish (see Figure 2). Of course, the material of the parts being checked must be considered when estimating the Figure 2: When testing hard or abrasive materials, it does not take long before the contact point on the gage is worn down, diminishing accuracy. durability of your gage. It has been found that rough-cast iron, with its high silica content, is extremely abrasive and will wear down the hard- est materials in a surprisingly short time. Cast aluminum parts will as well. Today, there are new materials like ceramics or especially hard materials that are designed for extreme wear being gaged. These characteristics must be taken into consideration when deciding on a wear-in- spection protocol. Conditions of cleanliness can be very import- ant in reducing the amount of wear on a gage. It does not take much effort to imagine how much wear there might be on a micrometer used in a shop where there is abrasive dust in the air. One should never forget that even the old reliable gage is subject to wear. It is imperative that the operator make it a habit to "check the checker" at regular inter vals.